Raysheet graduates, in the front row from left, are Frankie Stern, Lauren Binder, Ariel Lubow, and Halli James. In the back row, from left, are Ben Roth, Cory Nagelber, and Jonathan Steinberg. For the fourth year in a row, HaGalil, the New Jersey region of the Conservative movement’s United Synagogue Youth, has groomed a number of its high school students for leadership positions through its Raysheet program. HaGalil includes more than 1,100 members in 39 chapters throughout northern and central New Jersey. Every year, the Raysheet program, which in English means “beginning” (indicating a new beginning for recent high school graduates), selects students from a pool of applicants for training for future involvement, local or national, in USY or Kadima, the middle-school youth group. USY also offers members entering sixth through 12th grade an end-of-summer program called Kadima/USY Encampment. Raysheet graduates may choose to work at the camp as staff of the younger grades, thereby entitling them to a higher salary if they choose later on to be advisers, who are paid, for USY. “Although certain training will earn them a higher income, we have found that most of them do it for personal growth,” said Michelle Rich, associate director of the Mid-Atlantic USY district. “The program has been really successful because many of our staff members and advisers come in properly trained.” HaGalil is the only USY region that provides this form of training. 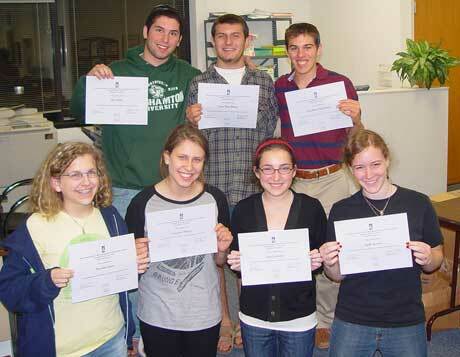 The two-day workshop was conducted last month in the USY offices in Edison. Students were taught goal-setting and ways to run effective programs for youth. “Seeing that there are many different approaches towards the same goal is always a reassuring feeling – it tells me that I don’t ever have to feel limited and that I can approach Jewish youth-planning in a wide variety of effective ways and always achieve results,” said Cory Nagelberg of North/South Brunswick USY, a graduate of the June program. Applicants to the Raysheet program wrote essays about what they hoped to gain from the workshop and what they saw as their future role in Kadima and/or USY after graduating from high school. Several of the Raysheet graduates, some of whom have been involved with USY since even before the beginning of high school, told The Jewish Standard what inspired them to continue involvement with the United Synagogue. “It’s a combination of the various angles [USY] provides to both prayer and social issues, the haven it offers up to connect with God and one’s peers, and the warm and overwhelmingly accepting nature of the organization,” remarked Lauren Binder, a member of the USY of Bridgewater. Although many of the graduates will not be attending college locally, they plan to stay involved with USY in one form or another.